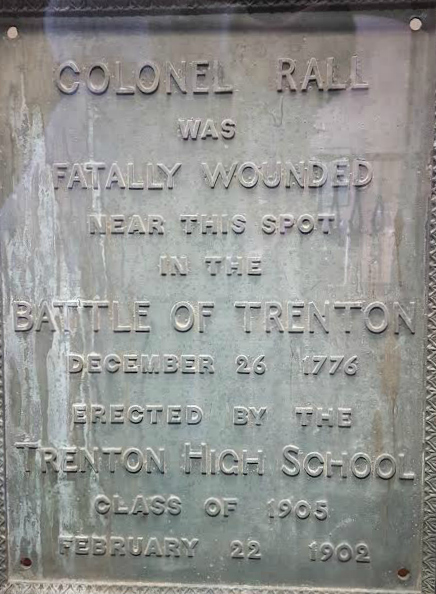 This bronze plaque was erected by the Trenton High School class of 1905 almost 125 years after the December 26, 1776 event that it commemorates. It marked the spot at which Colonel Johann Gottlieb Rall was mortally wounded near the corner of Broad Street (then called Queen Street, or Bridge Street) and what is now Academy Street, across the street from the Mercer County Community College James Kerney Campus. The building to which the plaque was affixed has been since torn down. 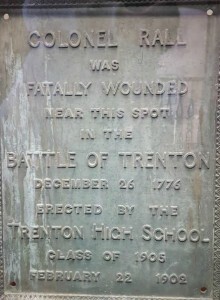 Colonel Rall was wounded while leading the Hessian counter-attack into downtown Trenton.